Travelling in a foreign country has often been a challenge – now technology comes to the rescue. Google has updated its Translate app to do voice and sign translations - just point your smartphone at signs, menus or whatever you want to understand. The California based internet giant introduced the new version of the Google Translate application on Wednesday. Google hopes it will be of used not just by people on their travels but also by professionals like teachers, doctors and police who have to carry out their jobs in increasingly multi-lingual communities. At the moment it’s available to and from French, German, Italian, Portuguese, Spanish and Russian into English, but is expected to become available in more languages. And the other good thing about it is that it works independently of the internet. “We’re taking it to the next level and letting you instantly translate text using your camera. 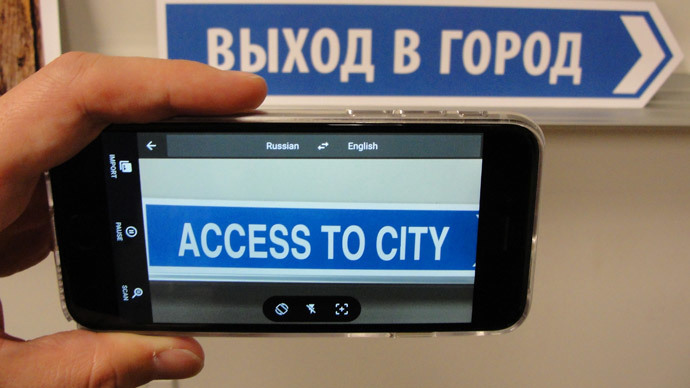 While using the Translate app, just point your camera at a sign or text and you’ll see the translated text overlaid on your screen—even if you don't have an internet or data connection,” the Google team writes on their official blog. The app uses ‘Word Lens’ technology, which uses the video mode in smart phone cameras to scan writing, identify words and then display them on the phone as if it was written in English. "If you are looking at a restaurant menu, it's nice to see which thing on the menu you are looking at so you can point at it when you order," Octavio Good, who developed the technology, told AFP as he used his iPhone to scan and translate an Italian pasta recipe. There is also a conversation mode in the new Google Translate, which uses voice recognition to translate both sides of a conversation in different languages. People can use up to 38 language options; an automated voice then speaks the translations as well as displaying them in writing on the phone’s screen. But unlike Word Lens the computing brains for translating conversations comes from Google servers so connections through Wi-Fi or telephone data is needed making the voice recognition service potentially much more expensive for people travelling overseas. Voice translation has been a feature of Google Translate on Android phones for a while but now that it is available on Apple’s iOS it will be “faster and more natural,” the company says.